Achieving balance requires that you assess what is important to you. The many demands of modern life can push us to make choices that can put us off-balance and have a detrimental effect on our habits, relationships, health, and career. In creating a balanced lifestyle, you must ascertain how much time and energy you are willing to devote to the different areas of your life. To do so, imagine that your life is a house made up of many rooms. Draw this house, give each part of your life its own room, and size each room according to the amount of importance you assign to that aspect of your life. You can include family, solitude, activities that benefit others, healthy eating, indulgences, exercise and working on self. You may discover that certain elements of your life take up an inordinate amount of time, energy, or effort and leave you with few resources to nurture the other aspects of your life. 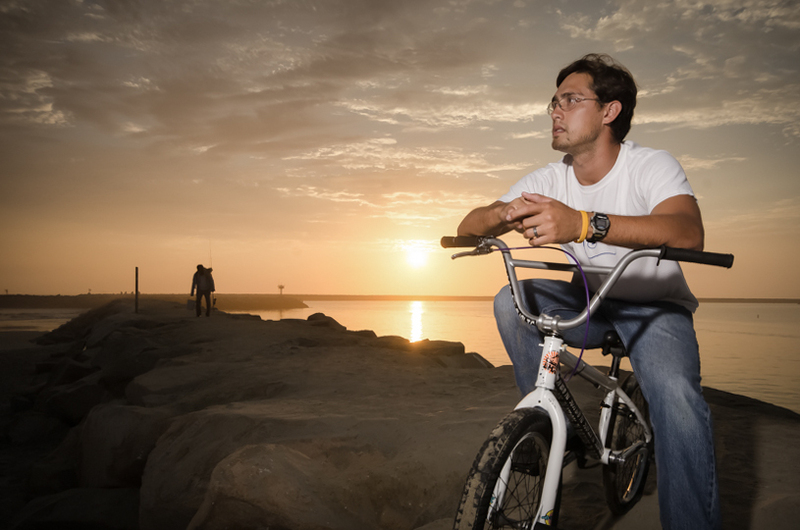 Shot at Oceanside, California, for a 2013 Calendar Project for a Corporate Insurance Client, what is interesting is not only the gorgeous sunset about the Fisherman in the background setting off to catch Dinner for his family. You can see more images at our Photo Website: http://www.kerstenbeck.com Please take some time to look around! …..We appreciate you kind support of our work! 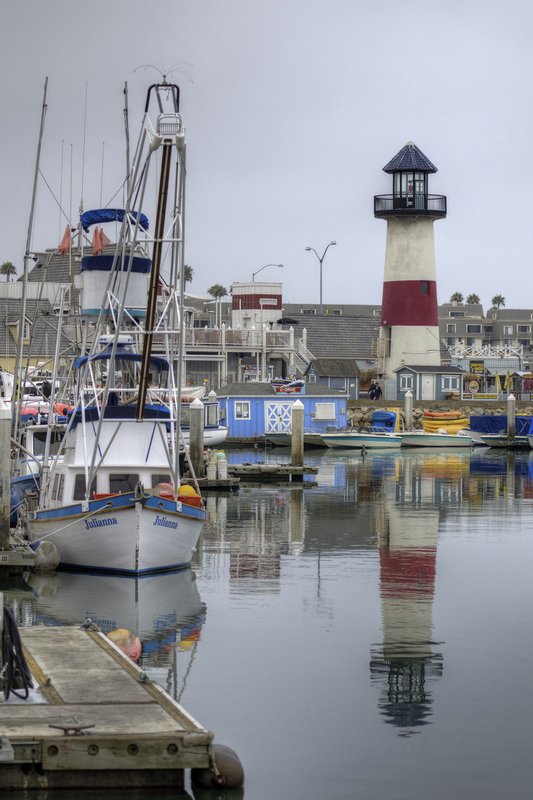 This is a postcard perfect shot of Oceanside Harbor in the early morning hours. We were on our way to take some shots of the surfers and this beautiful vista appeared. 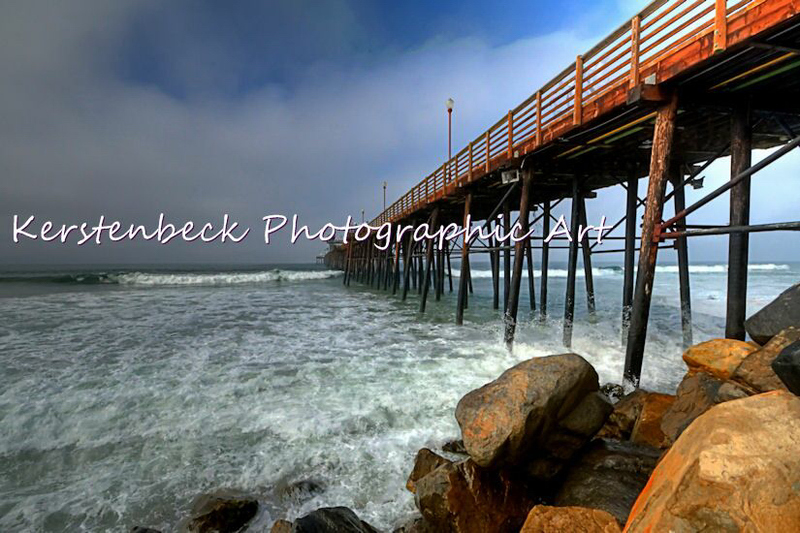 Oceanside is a coastal resort city located on California’s South Coast. Together with. 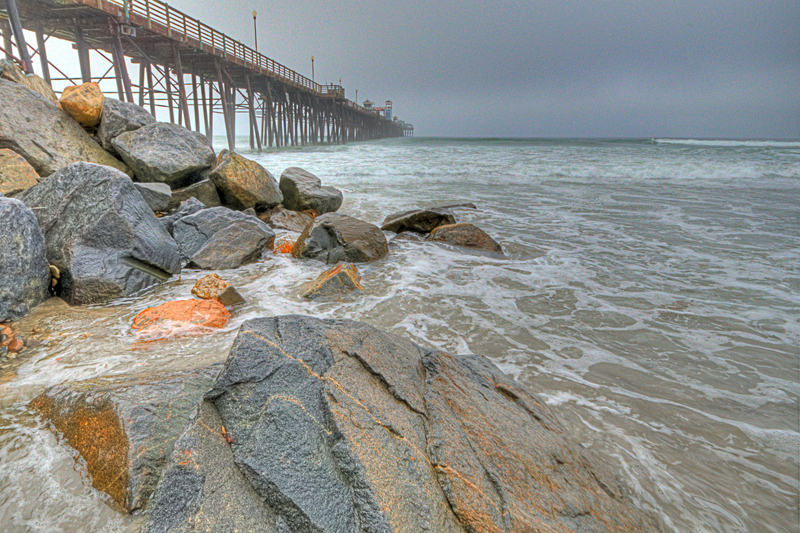 Oceanside is located just south of Marine Corps Bas Camp Pendleton, the busiest military base in the United States. Usually held the second weekend in September, Oceanside also holds an annual Oceanside Harbor Days festival with street vendors, food, and local artists displaying their wares. Oceanside is host to the world’s 2nd largest Beach Soccer festival, The Southern California Beach Soccer Championships has become an international event and it is usually held in the middle of May at the Oceanside Harbor Beach. 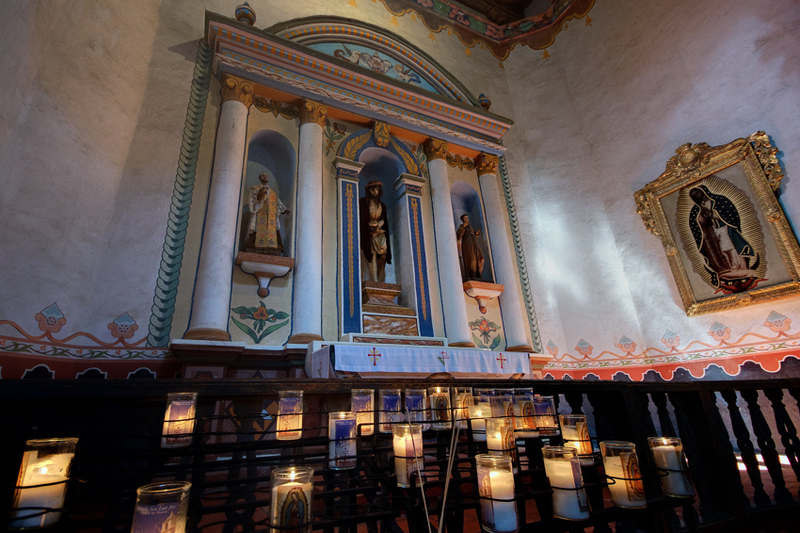 This is another shot from the inside of Mission San Luis Rey in Oceanside, California. The Padres were kind enough to allow photography and even tripods to be used which made shooting this so much easier. We’d like to thank them for their kindness and generosity. The goals of the missions were, above all, to establish a Spanish presence in the Las Californias province and to become independently self-supportive (by their standards and perceived needs). Ranching and farming were the most important industry of the mission. To have the indigenous residents (The Luiseño) using foreign skills, training in agriculture for European crops, blacksmithing, and domestic animal husbandry was given. The Luiseños were relocated and conscripted to do the herding, farming, construction, hide tanning, leather work, weaving, cooking, and cleaning. (Pretty much everything the Spanish didn’t care to do). Everything consumed and utilized by the Spanish and Luiseño living at the mission was predominantly produced there by those native people under the control of Padres and soldiers. Imports, by sea and overland, from central New Spain (Mexico) added with some trade goods and the Crown’s modest supplemental funds. 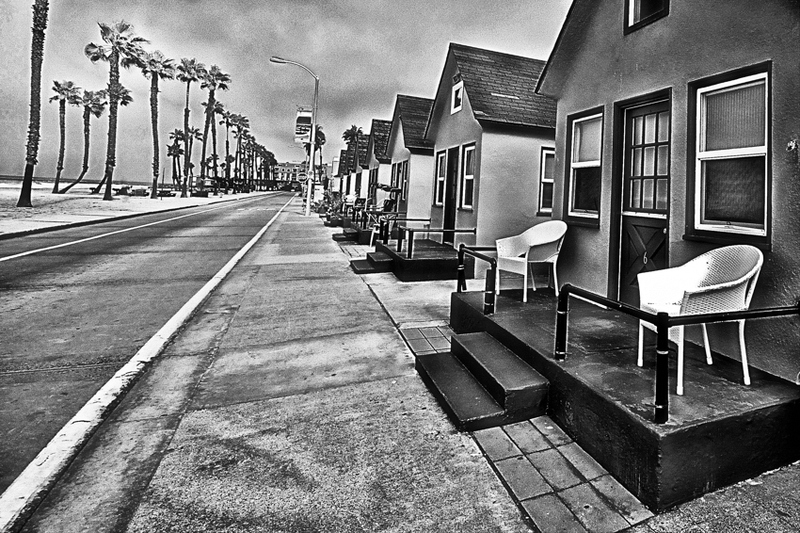 These quaint cottages line the boulevard that parallels the sweeping Oceanside Beach. 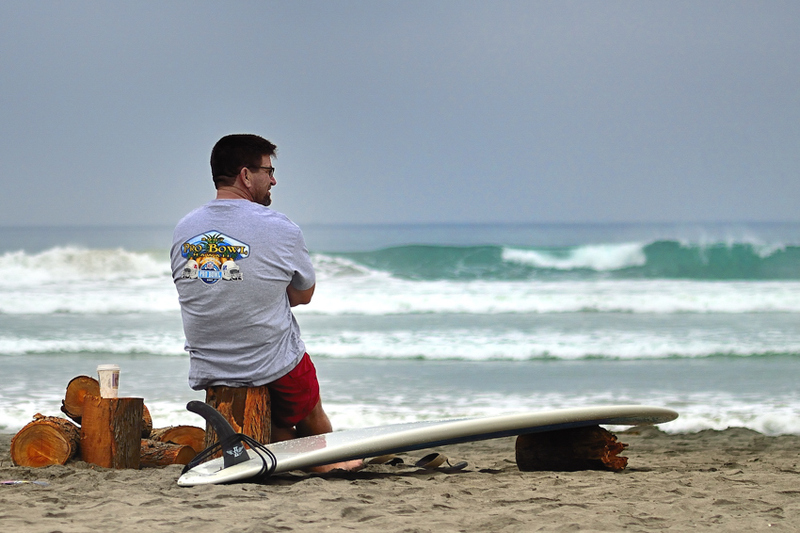 This is a popular surfing location in San Diego County and hosts many competitions. The pier is cool and have taken many shots (underneath) to get the odd textures and colors. How many recognize this pier? 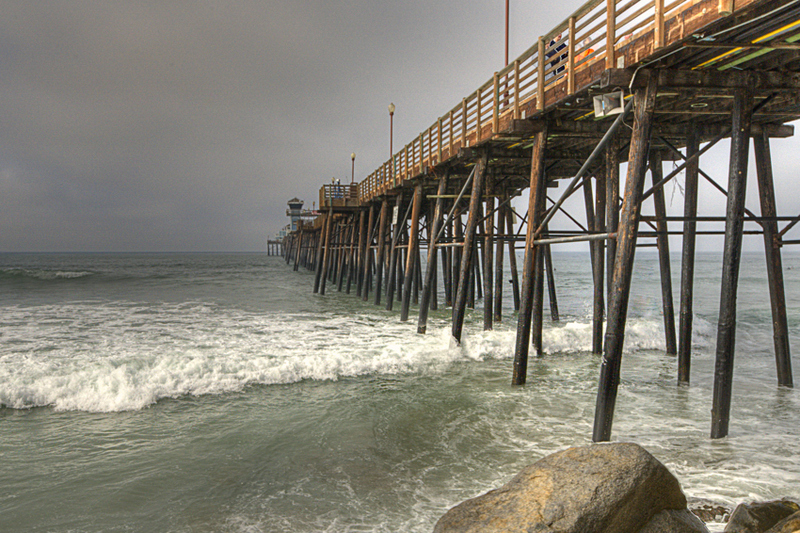 We have a mission to go to every beach along the coast of California and document the beauty of the piers. This one- Oceanside, CA.